Two things happened last week that were a reminder of just how vital real estate has become to Canada’s economy. On Friday, Statistics Canada released gross domestic product data that showed February was a banner month for sectors linked to housing. The real estate industry, residential construction, financial and legal services generated a combined 0.5 percent increase in output, the biggest one-month gain since 2014. Without those, the overall economy would have contracted slightly in February. A day earlier, the Ontario government released a budget that projects land transfer taxes will surpass C$3 billion ($2 billion) in the current fiscal year, from C$1.8 billion three years ago. For the province, it’s the difference between a balanced budget and a deficit. Measures of housing’s contribution to the economy are imprecise, but estimates largely put the direct contribution in excess of 20 percent. It’s much more than that once you add all the indirect effects, with benefits spread widely from lawyer fees to government revenue and increased retail purchases through so-called wealth effects as rising home equity values prompt households to ramp up consumption. 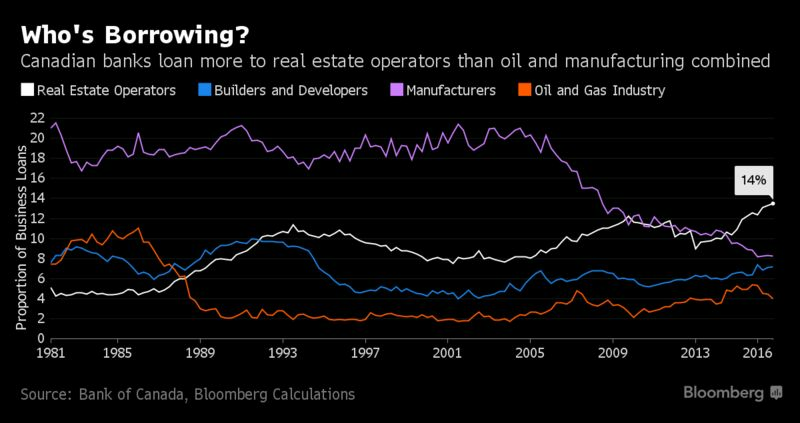 The big worry is that Canada has moved from a reliance on oil to a reliance on real estate. The influence of housing on the economy is so pervasive that it won’t take much of a slowdown to act as a major drag on the economy, said Mark Chandler, head of fixed-income research at RBC Capital Markets in Toronto. “You don’t need a collapse in house prices, you don’t need housing starts to be cut in half for weaker real estate sector to have a significant effect on GDP and incomes,” Chandler said. RBC’s ballpark estimate is that a 10 percent decline in national home prices would knock a full percentage point off growth. A Toronto Dominion Bank report from 2015 found the housing wealth effect has been responsible for about one-fifth of all growth in consumption since 2001. It’s hard to believe, but there was a time not long ago when Canada’s banks lent more to businesses than home owners. It was the norm in fact until the early-1990s, when mortgage loans surpassed business lending for the first time. Residential mortgages today make up about 52 percent of all chartered bank loans, versus 21 percent for business lending. Still, that portion of business lending is up from a record low of 19 percent in 2012, suggesting that as home valuations become stretched and as mortgage and capital regulations tighten, banks are increasingly looking to companies for lending growth. A closer look, however, reveals that much of the new business lending is in fact real estate related. Bank of Canada figures show 14 percent of all private business loans from chartered banks are now bound for so-called real estate operator industries, the biggest share in the history of data back to 1981. The C$27.4 billion in private loans to the sector, which represents companies that own and manage real estate assets, exceeds the combined lending to the manufacturing and oil and gas sectors combined. That’s on top of the C$15 billion loaned to developers, more than double levels in 2010. The chartered banks are also lending to real estate operators at the fastest rate on record — C$10 billion since the start of 2014. The pattern makes sense. Profit margins in real estate rental, leasing, and property management industries were around 34 percent in 2015, Statistics Canada data show, and banks want to lend to profitable businesses. Yet, it also means lenders are increasingly exposed to the industry on multiple fronts.